If you would have told me one year ago that I was going to be a homeowner by now, I would have rolled my eyes and told you to stop putting pressure on me. I’m doing just fine the way things are, thank you! But then, I started diving in to the personal finance blogging community and quickly learned from blogs like this one that your money is pretty useless sitting in a standard savings account. I also learned how renting a home can be a waste of money if you’re financially ready to buy. So I grabbed a handy myFICO calculator and crunched the numbers. And then my head exploded. Not only could I afford a home, I could afford a pretty decent home. Who woulda thought? I sure didn’t. I mean this in two ways. First of all, the home buying process is long. I was lucky enough to have a lender willing to do a 30-day close. That means only 30 days passes from the time you make an offer to the time you have the keys. This led to a scramble of gathering paperwork and signatures (see #5). I was unlucky enough to have sellers that were completely unprepared to sell a home. Plus, there were three of them. And they hated each other. To make a long story short, our close date got pushed back 4 times, we had to have the sellers pay to extend our interest rate offer and we were constantly living the reality of “hurry up and wait”. It ended up being a 60-day close. So what can you learn from this? Don’t expect things to go smoothly. It will just stress you out in the long run. Keep calm and take hiccups as they come. You’re going to have the house for, presumably, many years, so you can wait a few extra weeks to seal the deal. The second part of this lesson applies to once you’re in the house. We bought a historical home that seemed to have enough upgrades to be considered in pretty good shape. So we excitedly moved in, and then approximately 500 things broke. Or if they didn’t break they revealed themselves to be shockingly archaic (see #2). At first, I wanted to fix or improve everything immediately, which we did for approximately 3 weeks until we realized our home account had dwindled to a shockingly pitiful amount. Ouch. With our home budget already at serious risk, I then realized that our Dwell-worthy vision for the perfect home was going to take much longer than I thought. In fact, it’s probably going to take over a year. But it will be worth the wait! One of the biggest lessons I’ve learned is this: Home improvement takes time and care. Rushing it will look bad and will ruin your budget and savings account. Do one project at a time when your budget allows and after you’ve done a lot of research about it. Then, take your time to do it right. It will cost you less in the long run. One step in the home-buying process is the inspector stage. Our inspector was really nice, and did a good job of calming me down when he listed every little thing he could find wrong with the house – most of which weren’t necessary repairs. We had the sellers fix a few major things, and moved in feeling pretty confident. Well after one visit from our handyman, we learned that our house wasn’t grounded – meaning we’re not protected from electric surges. This is something an inspector could easily determine with the right tools. But the thing about inspectors is they know a little bit about a lot. They aren’t specialists, because they can’t be. If I were to do it all over again, I would have paid to have an electrician and plumber inspect the house separately. Hiring a local contractor like Tony’s Roofing to inspect your house may cost you some money up front, but they can save you a lot of money in the long run by finding problems that ordinary inspectors are ill-equipped to discover. Don’t get me wrong, buying a house is also very stressful. We spent a lot of nights anxiously waiting a call from our lender or realtor. Plus, a lot of the steps required us to drop everything and sign or meet someone. I often felt like I was on call. But here’s the weird part. The actual steps are easy. We signed 75% of our paperwork on our phones. Yup, didn’t even have to bust out a computer – what a hassle. Putting in an offer took seconds. The hardest part was probably meeting our inspector which took a whopping 20 minutes. No part of this process is time-consuming or difficult. So make sure you’re sure you want a house before you get started, because you might blink and own one. I applied for a mortgage with my boyfriend of six years. Although practically married, we had never really talked about our credit scores. I mean neither of us have had any major credit issues, so it’s not like we were going at this blind, we just didn’t know the specifics. I figured our lender would look at us as a whole, and my FICO® scores would help his or vice versa. Wulp, that’s not exactly the case. Our lender took the lowest of our six FICO Scores (one each for each credit bureau), which was his. Mine didn’t even matter. Next time, I’m going to make sure we’re both monitoring 3-bureau FICO Scores and credit reports for at least 9 months before we apply. When you get approved for a mortgage loan, an underwriter goes through your application, credit profile and paperwork trying to make sure you are who you say you are. The underwriter is looking for red flags, things that signify that you’re a credit risk… or a drug dealer. If you have a lot of change in your life in the last 5 years, you’re likely going to have to provide more paperwork. I honestly have no idea how I found all the paperwork required. We were asked to provide: W2s from 8 years ago, a letter from our landlord and even proof that my corporate credit card was actually a corporate card. It was crazy. I had about 55% of my employment and tax documents in a filing cabinet (whoopee!) and the other 45% scattered in various cabinets and “to do” piles. It made the process more difficult (although #3 still stands). Moral of this story: Organize your life. I am now in the process of scanning all of my paperwork into my Evernote so that if I’m ever asked to prove that I did indeed purchase a home in 2014, I will be able to do so. In the end, I’m thrilled to be a homeowner. It’s much less stressful and much more rewarding that I had imagined. Plus, I feel like it was a smart step towards reaching my financial goals. But with all of that said, I will definitely do some things differently in the future. 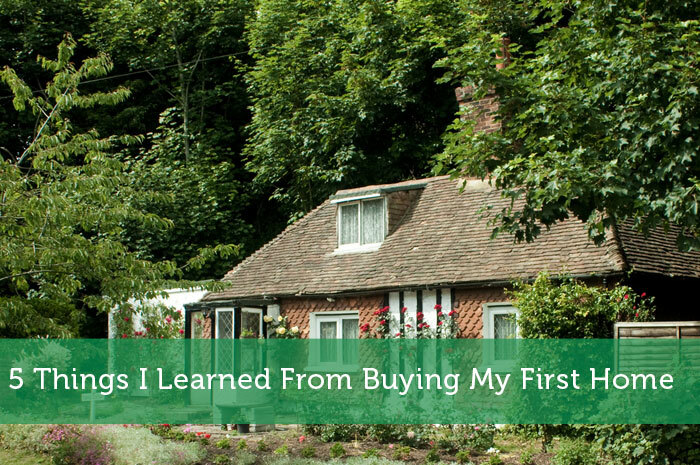 Did you have any surprising lessons in your home-buying process? If you’re thinking about buying your first home, start by seeing how much home you can afford. Kelsey Havens is a writer, financial health enthusiast, consumer protection advocate and Content Manager at myFICO. You can read more by Kelsey and other FICO experts by visiting the myFICO blog. Since it sounds like this wasn’t your ‘forever home’ did you try to buy a home that would make a good investment? Definitely. That was a major concern. We ended up buying a home close to a university in a college town. The neighborhood is up and coming and we got it at a great price. So fingers crossed it works out for us in the long run! I can definitely attest to #1. We bought a new house, so presumably inspections and whatnot would be a cinch. For some reason the state inspector didn’t approve the house and never really told anyone why. And they told us this on a Friday at 4:30pm, so naturally no one was there to answer our calls. The builder eventually got it sorted out bu we had to wait 2 more weeks for no real reason. Sounds like you’ve learned a lot already. I’d just like to point out that those affordability calculators are fun, but only show you what the bank is willing to give you, not what you can truly afford. 20 mins for a home inspection? A home inspection should last at least 2 hours. My advice is to get a good home inspector. I know they don’t know everything but they should spend more than 20 minutes in the home you want to buy. The home inspector was there for 2 and half hours with our Realtor. We just met him for the last 20 minutes to get the run down. But still, I think he could have done a better job! Ok. That sounds better. Wasn’t clear in the post that the inspector spent more than 20 minutes at the home. I remember my realtor also attended my home inspection but I noticed she was not very helpful at trying to get answers for things that didn’t work in the home. She was more concerned in making the sale and kind of brushed off some things that the inspector thought were a problem. I would not trust a realtor alone with this task. I would advise the home buyer to be present during the entire inspection appointment. I think Frugalwoods makes a good point below about inspectors being a racket. You just never know when a realtor and a home inspector are working together to make the sale. Kinda sounds like you got a bum home inspector! Ours spent 3 hours crawling through the house with a fine toothed comb… and still managed to miss plenty of things that we’ve discovered in the past couple of years. I honestly think that home inspectors are a bit of a racket. If you are familiar with building standards and relatively handy it’s doubtful the inspector will find something major that you didn’t spot. They are useful as negotiating tools, but pretty terrible at actually predicting what will go wrong with your house in the first couple of years. One related big thing we learned: Have plenty of cash on hand right after the sale. Some things are easier and cheaper to do before you move in, like refinish the floors or painting. Having some money set aside to do things like that before moving can make your life so much easier. I think a lot of people rely too heavily on an inspector to find issues. When I was buying my house, I followed him around and asked a ton of questions. I learned a lot from the experience and it made me feel more confident in the house’s condition. Asking questions is always a good idea because the more you ask, the more you learn. A lot people does not feel comfortable to ask questions. Buying a home can be one of the biggest decision for a lot of us. So it is important to check hundreds of time before taking the final step. Best of luck in your new life as a homeowner … it is filled with challenges, but it’s nice to have a piece of earth that you can call your own! Congratulations on getting your first home! Good luck on your second. Researching really pays off in the end to get ourselves out of regrets later on. Funny how different our lives are looking 12 months back. Congratulations on being a homeowner! #4 surprises me…when my wife and I refinanced earlier this year, they used both our credit scores, but used our “middle” score. I guess each bank does things differently…congrats on the home! Property buying won’t be all that stressful if you are financially ready and have a good agent to guide you through the whole process. It is also important to hire an independent conveyancer – I don’t want to end up buying a problematic property.